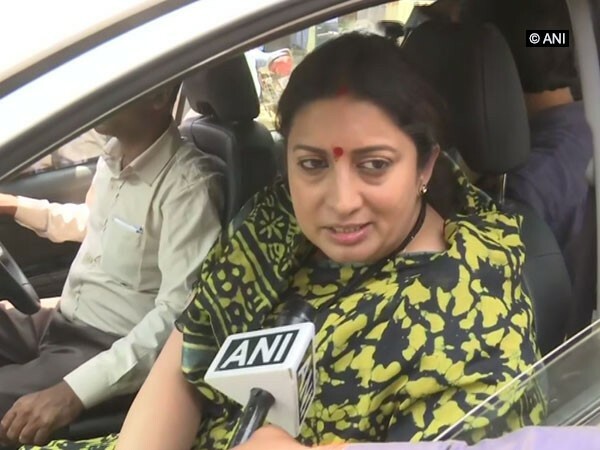 Amethi (Uttar Pradesh) [India], April 5 (ANI): Union Minister and BJP Lok Sabha candidate from Amethi, Smriti Irani on Friday said that Congress president Rahul Gandhi is supporting the anti-national elements who want to break India. "Yesterday, Rahul Gandhi went with anti-Bharat forces to file his nomination. Every time he reveals his real motive that he is not with Hindustan but with those elements who want to break Hindustan," said Smriti Irani, while talking to ANI at Jagdishpur in Amethi. "The people in the national capital have already heard how he stood in support of 'Bharat-tere-tukde-hoge' (India will be ripped apart) slogan. Also, the recently released manifesto of Congress under the leadership of Rahul Gandhi has tried to defame the Army and supported slogans like 'bharat-tere-tukde-hoge' ", said Smriti Irani. She also alleged that Rahul colluded with scamsters for financial gains. "He has to give answer to the nation why he stood with everyone who looted the nation. News paper reports says that Rahul Gandhi's name came up in AgustaWestland Scam, earlier also his name surfaced in land scam cases and he has benefitted himself in monetary terms," she said. The Congress manifesto released on Tuesday promised significant changes in the laws, like quashing of the Sedition law and amendment to the Armed Forces (Special Powers) Act (AFSPA).